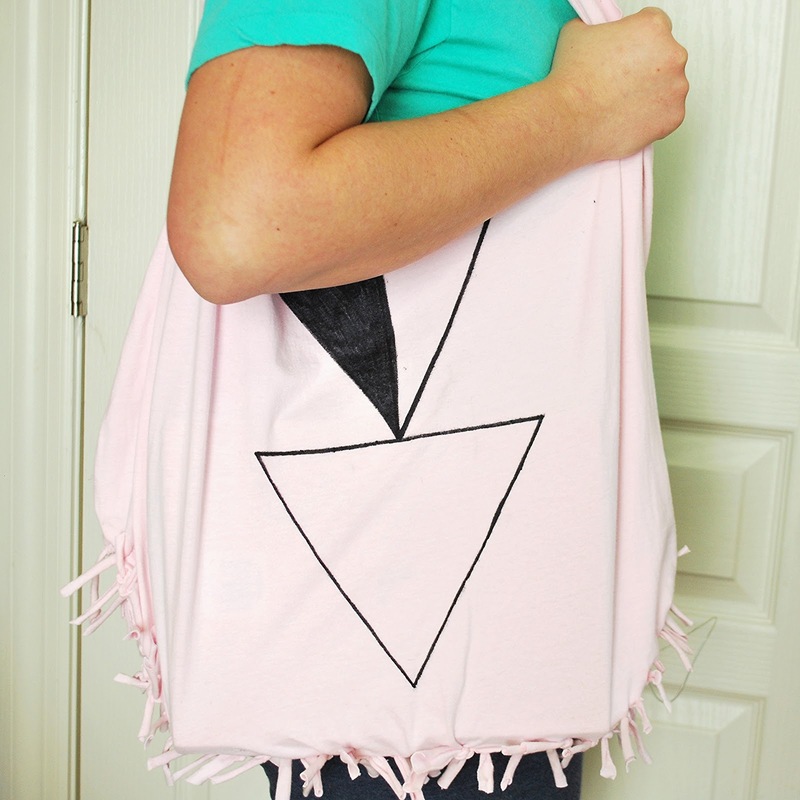 We've been meaning to make totes and produce bags out of t-shirts but it has taken us forever to actually do it. I don't know why... this is sooo easy. Especially since you don't have to sew anything! All you will need is a big XL t-shirt (one you are okay with cutting up), a Sharpie and some scissors. We are using a blank t-shirt so we can put our own design on it later. If you only have a shirt that is printed on, that'll totally work. Draw the shape of the bag on the shirt. We've seen bags made out of t-shirts where the straps go up to the shoulder (and the bag ultimately looks like a tank top) but, we wanted our straps to be more tote-like rather than grocery store plastic bag-like. Make sense? Eh.. doesn't really matter. This is how you make this bag! Cut strips upward from the bottom of the bag. Make sure you cut through both layers. There will be a top layer of fringe and a bottom layer right under it. You will tie each front piece to each back piece. To do this, you may need to stretch the pieces out by pulling them downward. They will roll up- like in the picture. Tighten the knot and repeat on all of the strips. It should look something like this at the bottom. At this point, you could turn your t-shirt inside out to hide the fringe OR you could keep. We kind of like the look to we're keeping it like it is. You could be finished here but we wanted a fun bag! Put something between the layers so your marker doesn't go through to the back. Draw whatever design you'd like with a Sharpie. Make sure to let the Sharpie dry on the bag. It will smudge and get on things if it hasn't completely dried. Shouldn't take too long. This is such a great idea! It could even work with old shirts that have awesome designs/patterns on them! That way you wouldn't have to get rid of that favorite t-shirt just because it has a hole in the armpit! I really like that the straps are "more tote-like" instead of very thin. I think that the thinner the straps are the more it will dig into your shoulder and start to hurt. I have got to try this! Thanks for the great ideas! I have to try this! I love when I can make something without sewing. Needles never get along with my fingers. They want a pokey relationship. LOVE the idea! I will have to try this, is there a way of making the strap slightly longer? I am quite tall and would like the bag to come down a little further and have the mouth of the bag rest about two inches above my hip bones. Love the design you drew! Did you use a stretchable shirt? I did it and it is awesome.I am making another for my little sisters 21 birthday.